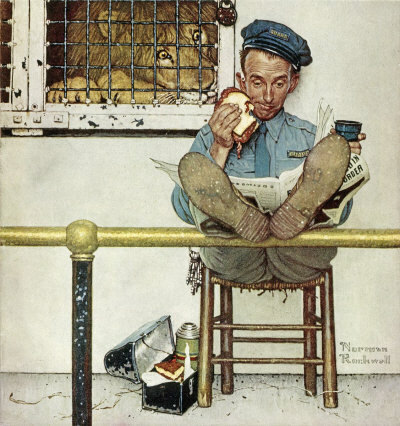 Lion and Zookeeper, a Norman Rockwell painting, appeared on the cover of The Saturday Evening Post published January 9, 1954. This is another timeless favorite of Rockwell collectors, a classic for all the ages. This painting was Rockwell's 279th overall out of 322 total paintings that were published on the cover of the Saturday Evening Post. Rockwell's career with the Post spanned 47 years, from his first cover illustration, Boy With Baby Carriage in 1916 to his last, Portrait of John F. Kennedy, in 1963. This was also the first cover for The Post in 1954. In 1954, there were six Norman Rockwell Saturday Evening Post covers published. The original oil on canvas painting, 11 x 10.5 inches or 28 x 26 cm, is part of a private collection. on page 196 of Norman Rockwell, A Definitive Catalogue by Laurie Norton Moffatt. One study also appears in the Norman Rockwell Catalogue on page 196. This is one of those classic Norman Rockwell images that just makes you smile. That poor lion! He can only watch as the zookeeper eats his lunch. That sandwich is abslutely dripping with meat. Part of it looks like it might actually fall out of the sandwich. The zookeeper, for his part, is unaware of the lion's desires to taste his lunch. He is intent on reading his newspaper and drinking his coffee. Lion and Zookeeper was only one of 322 Norman Rockwell Saturday Evening Post covers; Here is the list of Norman Rockwell Saturday Evening Post cover illustrations. The story is told that Rockwell wanted the lion to be more desireous of the zookeeper's lunch. However the lion had just been fed a short while before Rockwell and his photographer's arrival. The funny thing is that Rockwell tried to arouse the lion kore by roaring at him. He left that day with a sore throat. He couldn't affect the lion's demeanor. Do You Have A Great Story, Opinion Or Contribution About Lion and Zookeeper?